It’s football season, which means a lot to people: fantasy leagues, tailgating and hours spent on the couch surrounded by friends and beer. Unfortunately, it doesn’t mean much to me except my Sundays of bike rides and farmers markets are over with Eddie for the next few months. Instead of soaking into sorrow, I’m coming to the table with a game-plan: write the recipe play-book. Sure, I’ll dive into my yoga practice, but I’m also expanding my recipes to integrate football friendly fare. This is Man-Food from a female foodie perspective and my hope is to find common ground somewhere in the kitchen. If you have any great ideas, I’m open. A few months ago I went to a cookbook reading/signing at the Book Larder. 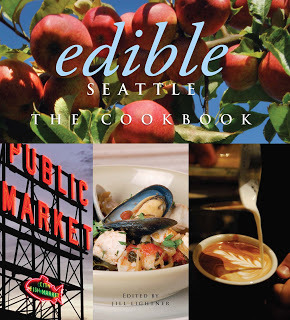 Eddie bought Edible Seattle: The Cookbook and I picked up a gem by Jess Thompson, Pike Place Market Recipes. I love that Eddie bought this book, but he has yet to make anything from it (or two others he’s purchased). After thumbing through both on Sunday morning in bed, I found a few options that sparked my interest and creativity. This week I’m preparing All-Day Baked Beans with Bacon, Honey and Rum from Edible Seattle: The Cookbook. I followed the recipe as best I could. Cooking and taste preferences are so subjective, I believe in improvising when necessary. After all, you’re the one who’s eating it. That said, my choices include soaking the beans a day in advance, using dark molasses instead of mild, adding an extra tablespoon of dijon and 1/2 teaspoon of pepper. Adjustments are reflected in the recipe. 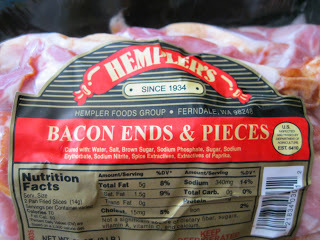 Foodie Note: I love Hempler’s Bacon Ends & Pieces. It’s less expensive (per pound) than traditionally cut bacon and you end up with really good knobs of meat. 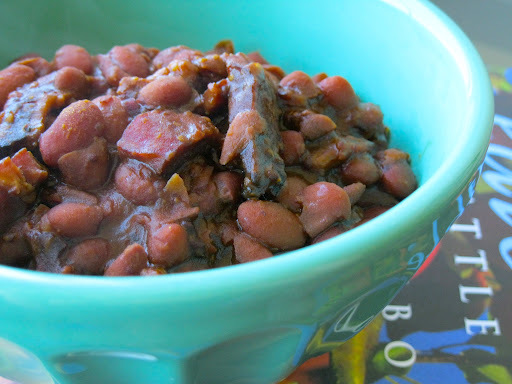 Cut two handfuls into chunks for the beans, then throw the rest into your freezer for brunch another day. 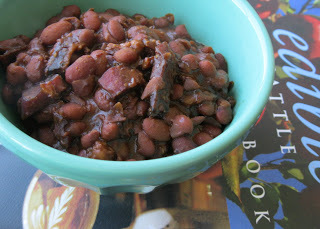 Foodie Note: 1 Lb of beans = about 2 cups; substitute regular honey for the ‘spicy honey’ if you need. If you get pressed for time, turn up the oven temperature and keep an eye on the liquid for desired consistency. 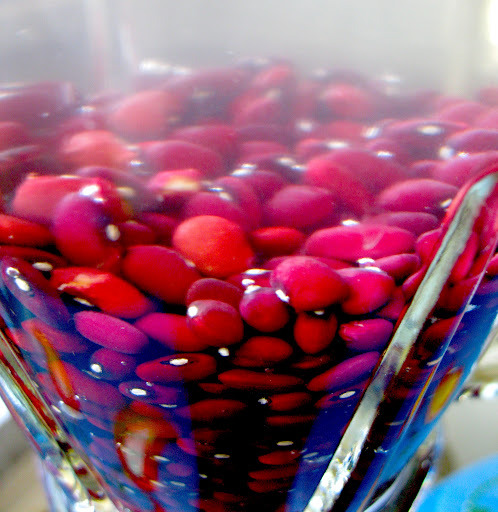 A day ahead of making the dish, prepare beans. Pour beans into a colander and check them over for any stray pebbles or plant material. Rinse under cold water, pour into a bowl and cover with water. Soak for 8 hours or overnight. Strain, rinse and pour into a large stockpot. Cover completely with cold water, bring to a boil over medium-high heat and simmer for 1.5 hours, adding more water as needed. Once tender but not yet creamy inside, strain and reserve beans. This can be done the day before; store in refrigerator. Stir; then continue to bake, checking the beans every 30 minutes or so, stirring any caramelized pieces back under, until the water is totally absored, the beans are plump and creamy, and the top of the dish is caramelized. You can cook the beans anywhere from 3-8 hours. 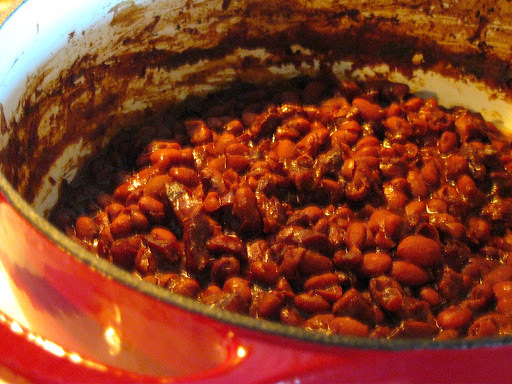 If the beans aren’t completely gooey and soft, add more water and keep cooking. Stirin the honey, taste and season accordingly with salt and pepper. Serve hot. The dish can be made a day in advance and reheated before serving. This looks so delicious, Christina! I can't wait to try these beans. What could a meat free alternative be do you think? These look delicious! Thanks. 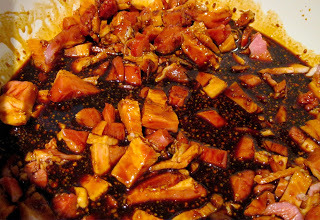 That's a great question – you want the smokiness and texture of the bacon, so maybe a little liquid smoke and temph added at the end could do the trick. If you try these out or come up with a better idea, please report back 🙂 Thanks for the question!